Imagine, awakening to new possibilities and being energized to reach for your dreams, everyday? Well, all this is possible and more with the Awyken App. Awyken has assembled a unique blend of proprietary intelligence learned from neuroscience research, the best of the best of self improvement resources and over 50 years of coaching and training people how to maximize their human potential for life purpose fulfillment. Very simply, We help You Awyken your life potential. 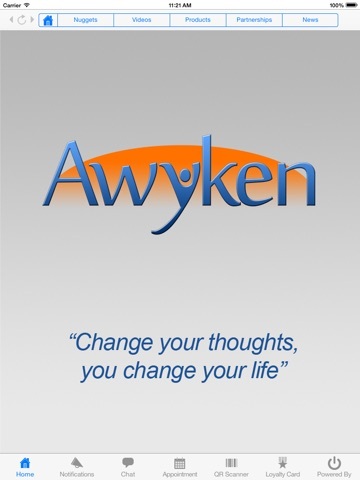 If we have peaked your interest, download your Free Awyken app right now to subscribe and receive your Free Daily Awyken Inspirational Nugget to keep the spark you need to approach each day with Hope, confidence and creativity. Imagine starting your day with an Awyken inspirational wisdom nugget that gives you the edge you need to face the challenges and opportunities presented to you each day. You were born with great human potential inside you. Our unique self discovery and development process will help Awyken You to who you were born to be. Isn't time you were Awykened?